Forecasters are already starting to make predictions for what might be in store as our sun winds down its current sunspot cycle in a few years. Are we in for a very intense cycle of solar activity, or the beginning of a century-long absence of sunspots and a rise in colder climates? Figure showing the sunspot counts for the past few cycles. Ever since Samuel Schwabe discovered the 11-year ebb and flow of sunspots on the sun in 1843, predicting when the next sunspot cycle will appear, and how strong it will be, has been a cottage industry among scientists and non-scientists alike. For solar physicists, the sunspot cycle is a major indicator of how the sun's magnetic field is generated, and the evolution of various patterns of plasma circulation near the solar surface and interior. Getting these forecasts bang-on would be proof that we indeed have a 'deep' understanding of how the sun works that is a major step beyond just knowing it is a massive sphere of plasma heated by thermonuclear fusion in its core. For over a century, scientists have scrutinized the shapes of dozens of individual sunspot cycles to glean features that could be used for predicting the circumstances of the next one. Basically, we know that 11-years is an average and some cycles are as short as 9 years or as long as 14. The number of sunspots during the peak year, called sunspot maximum, can vary from as few as 50 to as many as 260. The speed with which sunspot numbers rise to a maximum can be as long as 80 months for weaker sunspot cycles, and as short as 40 months for the stronger cycles. All of these features, and many other statistical rules-of-thumb, lead to predictive schemes of one kind or another, but they generally fail to produce accurate and detailed forecasts of the 'next' sunspot cycle. Prior to the current sunspot cycle (Number 24), which spans the years 2008-2019, NASA astronomer Dean Pesnell collected 105 forecasts for Cycle 24. For something as simple as how many sunspots would be present during the peak year, the predictions varied from as few as 40 to as many as 175 with an average of 106 +/-31. The actual number at the 2014 peak was 116. Most of the predictions were based on little more than extrapolating statistical patterns in older data. What we really want are forecasts that are based upon the actual physics of sunspot formation, not statistics. The most promising physics-based models we have today actually follow magnetic processes on the surface of the sun and below and are called Flux Transport Dynamo models. The sun's magnetic field is much more fluid than the magnetic field of a toy bar magnet. Thanks to the revolutionary work by helioseismologists using the SOHO spacecraft and the ground-based GONG program, we can now see below the turbulent surface of the sun. There are vast rivers of plasma wider than a dozen Earths, which wrap around the sun from east to west. There is also a flow pattern that runs north and south from the equator to each pole. 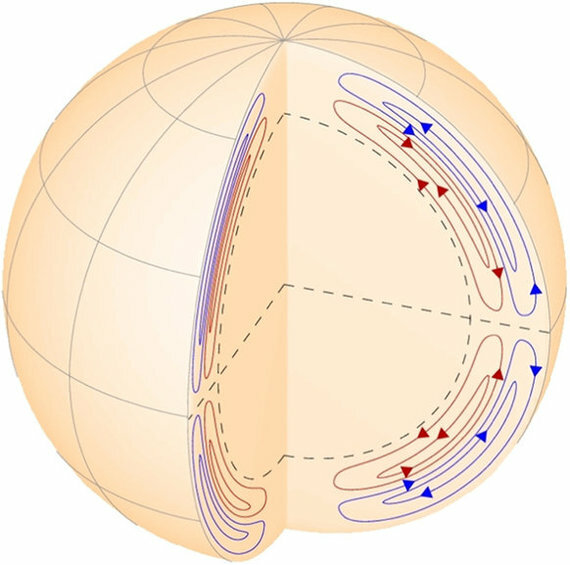 This meridional current is caused by giant convection cells below the solar surface and acts like a conveyor belt for the surface magnetic fields in each hemisphere. The sun's north and south magnetic fields can be thought of as waves of magnetism that flow at about 60 feet/second from the equator at sunspot maximum to the poles at sunspot minimum, and back again to the equator at the base of the convection cell. At sunspot minimum they are equal and opposite in intensity at the poles, but at sunspot maximum they vanish at the poles and combine and cancel at the sun's equator. 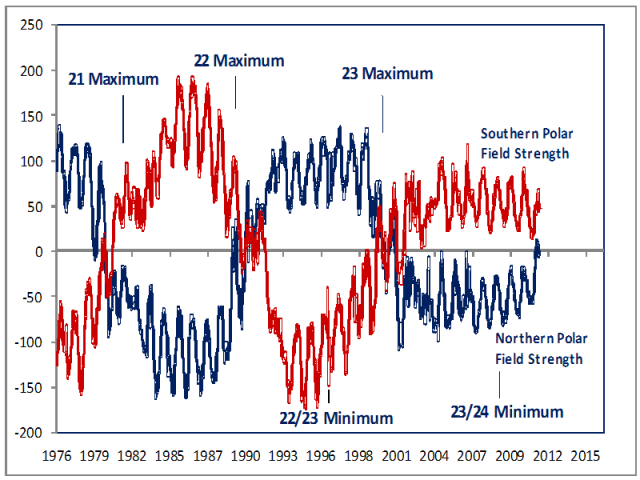 The difference in the polar waves during sunspot minimum seems to predict how strong the next sunspot maximum will be about 6 years later as the current returns the field to the equator at the peak of the next cycle. The forecasts suggest Cycle 25 might continue the declining trend of polar field decrease seen in the last three sunspot cycles, and be even weaker than Cycle 24 with far fewer than 100 spots. Figure showing the meridional circulation patterns on the sun. So what can we bank on? Statistically speaking, the current Cycle 24 is scheduled to draw to a close about 11 years after the previous sunspot minimum in January 2008, which means sometime in 2019. We entered the Cycle 24 sunspot minimum period in 2016 because in February and June, we already had two spot-free days. As the number of spot-free days continues to increase in 2017-2018, we will start seeing the new sunspots of Cycle 25 appear sometime in late-2019. Sunspot maximum is likely to occur in 2024, with most forecasts predicting about half as many sunspots as in Cycle 24. The bad news is that some studies show sunspot magnetic field strengths have been declining since 2000 and are already close to the minimum needed to sustain sunspots on the solar surface. This is also supported by independent work in 2015 published in the journal Nature. By Cycle 25 or 26, magnetic fields may be too weak to punch through the solar surface and form recognizable sunspots at all, spelling the end of the sunspot cycle phenomenon, and the start of another Maunder Minimum cooling period perhaps lasting until 2100. But the good news seems to be that none of the current forecasts suggest Cycle 25 will be entirely absent. A few forecasts even hold out some hope that a sunspot maximum equal to or greater than Cycle 24 is possible. If you are an aurora watcher, 2022-2027 would be the best years to go hunting for them. If you are a satellite operator or astronaut, this next cycle may be even less hostile than Cycle 24 was! In any event, solar cycle prediction will be a rising challenge in the next few years as scientists pursue the Holy Grail of creating a reliable theory of why the sun even has such cycles in the first place!